Your assignment is to create a game board based on your fantasy book. • You are to create a pathway for a game board with a Start and Finish. On the squares of the pathway, you will put the main events of the story, including the conflict and resolution (solutions) in pictures and words, with some squares remaining blank. • You will need to include directions for the game. • The title, date, author as well as pictures need to be on the game board. • Be sure your game goes forward so that someone will win. • For extra credit, you can make the game pieces as characters or objects in the story and include a decorated box for the game board. Game boards are due: May 31st! Imagine that the person you read about walked into your classroom and introduced him or herself. What would he or she say? How would the person talk, act, and dress? For this project, you will prepare a short presentation as if you are the subject of your biography. 1. Find a biography that interests you and is on a reading level within your reading range. 3. Write a one-page monologue that you will present to the class. Write as if you are the person talking about him or her-for example, “I was born in 1877.” Incorporate the information from your notes. 4. Read your monologue aloud and then revise it. Time yourself presenting your speech and make sure it takes no longer than five minutes. Revise if necessary. Write your final draft neatly on index cards. You will turn in your index cards, so write your name on each one. 5. Practice your speech so that you do not need to read from the index cards. (You may refer to them, but you should be able to make eye contact for most of your presentation.) Practice speaking and acting as you imagine the person would have. 6. Find out what the person looked like and how he or she dressed. On the day of your presentation, you will either dress in a costume to look like the person or bring in a poster-size, colorful picture of him or her that you’ve drawn. Did you look at your audience? Were you clear and smooth in your speech? Did you tell us all about your person? Did you speak as if you were the person? Rubric and all information is on Schoolspeak! Due January 23rd! One Paragraph Summary of Free Choice Book Due January 31st! This month the students will be creating a Cereal Box and Commercial about their Fantasy Book. Due: December 13th! Our October Book Report is on a Mystery Book! 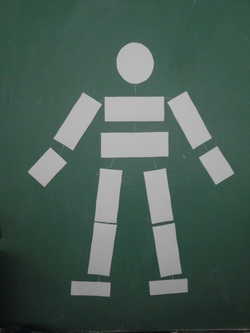 Below you will find copies of the files of the directions the body shape and the rubric for this project.